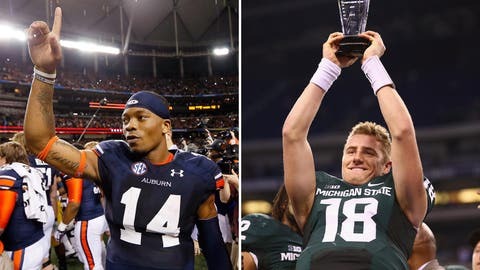 Nick Marshall and Connor Cook will enjoy their trips out to Pasadena in January. And we’ve finally reached the end. It’s been a fantastic college football season, with 15 weeks full of superb games and plenty of surprises to keep our attention. But now it’s time to go bowling and put a cap on the 2013-14 season. Can Auburn finish off its magical run by beating Florida State and winning its second national championship in the last four years? Will Michigan State, coming off a victory over Ohio State in the Big Ten title game, go out on top by beating Stanford in the Rose Bowl? Speaking of those Buckeyes, they are off to Miami to play Clemson in the Orange Bowl. Will they earn a 25th win in the last two seasons under Urban Meyer? We preview all five BCS bowls and pick winners for each, starting in Pasadena, Calif., with the biggest of them all. There was a time when Florida State playing for the national championship was the norm, but the 2001 Orange Bowl loss to Oklahoma was a long time ago. The program is back and roaring under head coach Jimbo Fisher, with a loaded team full of next-level talents and elite athletes, built up over the last few years thanks to several whopper recruiting classes. The Seminoles have rolled through everyone on the way to Pasadena, with all 13 wins by double digits and none of them remotely dramatic. If the streak of SEC championship dominance is going to end, Florida State is the worthy team to make it happen. Auburn has been more than just a team of destiny; it’s been a team of momentum. The Tigers struggled against Washington State and Mississippi State early in the season and lost to LSU by 14, but the offense slowly started to kick in. As the season wore on, Auburn held on against Texas A&M, rumbled through the weak part of the late schedule and then came up with all-time miracles in back-to-back games against Georgia and Alabama to be the improbable representative of the SEC West in the conference title game. But there wasn’t any Team of Destiny thing happening against Missouri, with the unstoppable running game rolling at will. With Ohio State losing to Michigan State in the Big Ten championship, the shocking run was complete, and now Auburn has a chance at its second national title in four years. 1. It’s the last season of the BCS era, and it’s the last national championship without a playoff format. Either it’ll be Florida State’s first national championship since Peter Warrick and the 1999 Seminoles outgunned Michael Vick and Virginia Tech in the 2000 Sugar Bowl, or it’ll be the eighth straight BCS championship for the SEC, with no end to the dominance in sight. Next year with the playoff, there will be a slight margin of error for one-loss super-stud teams like Alabama. Florida State can end the run or be a part of a trivia question. 2. Can the Auburn rushing attack really do that again? The Missouri run defense was among the best in the nation all year, and then Auburn ripped up 545 yards and seven touchdowns in the SEC championship. Alabama’s defense was arguably the best in college football, but the Tigers had few problems with 296 yards on the ground with two scores. Florida State’s run defense has allowed just five scores all year and only one team – Boston College – to hit the 200-yard mark. 3. Can Florida State really be that good? The Seminoles ripped and roared through everything in their path, highlighted by a 51-14 win over a jacked-up Clemson in its own house. Since mid-October, it’s been a true walk in the park for a team that hasn’t come close to being challenged. Boston College lost by 14; no one else has come closer than 27. 1. QB Jameis Winston, Fr., Florida State: It’s not official yet, but Winston is going to be a landslide Heisman winner as the signature star of the 2013 college football season. Past the legal issues and concerns, now the focus will be to see if the young superstar can reach an even higher level by winning a national title as a freshman to go along with a Heisman. Auburn’s Cam Newton was the last quarterback to accomplish the double-double back in 2010 (he was a junior). 2. RB Tre Mason, Jr., Auburn: He was having a nice year, highlighted by a 178-yard performance against Texas A&M, and then came the finishing kick: five straight 100-yard games to close the year, including 164 yards and a score against Alabama and 304 yards and four touchdowns on 46 carries against Missouri. Yes, he’s a product of the system, but the 1,621 yards and 22 scores are impressive in any attack. 3. QB Nick Marshall, Jr., Auburn: A decent passer, he came up with 339 yards and two scores in the win over Mississippi State, but he didn’t exactly bomb away on a regular basis throughout the rest of the season, finishing with just 1,759 yards and 12 touchdowns with five picks. As a runner and peerless leader of the Gus Malzahn offense, he’s something truly special, tearing off 1,023 yards and 11 touchdowns with 101 yards and a touchdown against Missouri. There shouldn’t be anything too fancy or too finesse about a Rose Bowl matchup with the Big Ten and Pac-12 champions. Last year, Stanford beat Wisconsin, but the Badgers got in only because Ohio State wasn’t eligible to play for the Big Ten championship. Michigan State didn’t need any breaks, blasting away on the Buckeyes to ruin Urban Meyer’s national title dream to get to Pasadena for the first time since 1988. In its fourth straight BCS bowl appearance, Stanford is used to the big-game atmosphere by now. In back-to-back Rose bowls for the first time since the 1970 and 1971 teams, the Cardinal has a shot at its third 12-win season in four years. 1. Could this be an end of an era? Jim Harbaugh kick-started Stanford’s amazing run, but David Shaw has taken it to another level. Shaw’s name is on the short list for several possible NFL head coaching openings. 2. This is the first BCS bowl game for Michigan State – at least in the BCS era. If the Spartans win, they have a shot at finishing No. 2 in the nation if Alabama loses and the BCS championship loser gets blown out. 3. Defense, defense, defense. Michigan State’s D was No. 1 for most of the year, and it held up reasonably well against Ohio State, coming through when needed in the second half. Stanford hasn’t allowed more than 400 yards of total offense since the Oct. 12 loss to Utah. 1. RB Tyler Gaffney, Sr., Stanford: Even though he came up with a big home run on the first drive against Arizona State in the Pac-12 championship, there’s little fancy about his game. The tough Cardinal runner ripped off 1,626 yards and 20 scores on the year, with 100-yard games in seven of his last eight games – he wasn’t needed much against Cal, running for 94 in the win. 2. CB Darqueze Dennard, Sr., Michigan State: Enter the No Fly Zone at your own risk. The best pure cover corner in college football came up with four picks and 10 broken-up passes, but the stats are misleading, as few quarterbacks tested him as the season wore on. Physical, he’s a good tackler and should match up well with the tough Cardinal. 3. QB Connor Cook, So., Michigan State: After coming on late last season, he struggled mightily to kick off 2013. The offense went nowhere, he couldn’t find any rhythm and there wasn’t anything there to suggest he’d end up as the star of the Big Ten championship, completing 24 of 40 passes for 304 yards and three scores with a pick. If the Ohio State game was his coming-out party, this could be his shot to make a huge name for himself going into the offseason. The Sugar Bowl is normally the Holy Grail for SEC programs, but not for the elite of the elite ones in the BCS era. Alabama might have dreamed the impossible dream of a Duke upset over Florida State in the ACC championship, but instead of getting to play in the BCS championship, the Crimson Tide now have to flex a little bit of muscle and hope to end up No. 2 in the final rankings. Oklahoma was all but left for dead after getting whacked around by Baylor, but it came back with two nice performances against Iowa State and Kansas State and pulled off a mini-miracle to keep Oklahoma State out of the Fiesta Bowl. The Sooners came up with yet another 10-win season under Bob Stoops – the fourth in a row and the seventh in eight years – but outside of the win over the Cowboys, the season will be remembered for this showdown. 1. Oklahoma vs. Alabama – it sounds like big-time college football, but it’s just the fifth meeting all-time between the superpowers. The last one came in 2003, but Alabama was bad, finishing 4-9 and losing to OU 20-13. In the 1963 Orange Bowl, the game meant something to the 9-1 Tide in a 17-0 win, but the Sooners were mediocre. Even though the national title isn’t on the line, this is the biggest matchup between the two. 2. How motivated will Alabama be? Will this be the ultra-focused team looking to make a statement that, yeah, this really might be the best team in college football? Can it come up with something jaw-droppingly sensational like the 49-7 win over Michigan State in the 2011 Capital One Bowl, or will it be uninterested and sluggish like it was against Utah in the 2009 Sugar Bowl loss? 3. Could this be the beginning of a new rivalry between Stoops and Texas head coach Nick Saban? The rumors won’t go away – partly because Saban isn’t quashing them – and it’s sure to be a huge storyline unless there’s a new contract extension of some sort and/or a major vote of confidence for Mack Brown. 1. QB AJ McCarron, Sr., Alabama: He might not be able to close out his career as the starter of a three-time national champion, but he could finish up with a fourth straight bowl victory and a third straight BCS win. This is his final game for the Tide, and while he has already cemented his place in the school’s history, going out with losses to Auburn and Oklahoma would sour things a wee bit. 2. WR Jalen Saunders, Sr., Oklahoma: While he might not be coming up with the big plays on a regular basis as a receiver, he caught a very big touchdown pass against Oklahoma State to go along with a brilliant punt return for a score. The team’s leading receiver, he has caught 56 passes for 654 yards and six scores, but he’s doing bigger things with the ball in his hands as a punt returner, averaging 16.8 yards per pop with two scores. 3. WR Amari Cooper, So., Alabama: Injured over the first half of the season, he didn’t catch his first touchdown pass until late October against Arkansas. He failed to come up with a 100-yard game all season and then came the 99-yard play against Auburn that would’ve been the signature moment of the season if it weren’t for all the nuttiness that ensued. He’s showing the same quickness and pop of last year, and with even more rest to heal up, he could explode on the OU secondary. Oates, Garfunkel, 2013 Ohio State and Clemson. The two power programs are playing second banana in their respective conferences to Michigan State and Florida State, as those get to have all the fun in Pasadena, albeit in different games. However, there’s a chance for Ohio State to finish in the top four in the final rankings, depending on what happens in the other big games. For Clemson, after the tremendous win over LSU in last year’s Chick-fil-A Bowl, this could be another shot at legitimacy after failing miserably in two of the three big games this year — beating Georgia in the opener but getting blown away by Florida State and losing to South Carolina. 1. No matter what happens in this game, it can’t be more interesting or eventful than the only other time the two hooked up. Clemson won the 1978 Gator Bowl 17-15, but no one remembers that. Charlie Bauman would go into college football lore as the guy who was sucker-punched by legendary Ohio State head coach Woody Hayes following an interception. Urban Meyer is unlikely to continue the tradition. 2. Ohio State is back in a big-time bowl game. Had they been eligible and had they gotten by Nebraska in the 2012 Big Ten championship, the Buckeyes – not Alabama – would’ve played Notre Dame for the national title. The 2011 transition team lost to Florida in the Gator Bowl, but before that, BCS bowls were part of the norm for Ohio State, going to six straight under Jim Tressel. 3. There’s a chance this could be the most impressive of the BCS matchups, at least outside of the BCS championship. Clemson came into the season as one of the HOT programs, and it has the firepower and the talent to test an Ohio State defense that couldn’t stop a mediocre Michigan State attack and was clowned by Devin Gardner and Michigan. 1. QB Tajh Boyd, Sr., Clemson: It’s debatable, but at least in terms of stats, Boyd is the greatest quarterback in ACC history. However, he never quite gets his due nationally because his team doesn’t always come up with the big wins in clutch moments – 156 yards and two picks against Florida State this year was part of the problem. If he and Clemson win this game, he goes out as a true Tigers legend. 2. RB Carlos Hyde, Sr., Ohio State: When asked if he thought he should’ve given Hyde more than 18 carries against Michigan State, Meyer glumly mumbled, “Yup.” The big, bruising back was cranking out 6.6 yards per carry against the Spartans, yet the offense started to go away from him in key moments in the second half. The Urbster isn’t going to make the same mistake twice. 3. WR Sammy Watkins, Jr., Clemson: After a down sophomore season, Watkins came back roaring with 85 catches for 1,237 yards and 10 scores on the way to earning a spot as a Biletnikoff finalist. He was held in check – relatively speaking – by Florida State and South Carolina, scoring against the Seminoles but failing to hit 100 yards against either team. Almost certainly off to the NFL after this game, this is his chance to showcase what he can do against a good, but not great, Buckeyes secondary. Get ready for a slew of “if someone told you UCF and Baylor were playing in the Fiesta Bowl” type of storylines, but it really is a special moment for two programs that aren’t exactly household college football names. Even so, Baylor has the potential to close out a special season with a tremendous win, going 11-1 with an outright Big 12 championship, dominating just about everyone except Oklahoma State, and even in that game QB Bryce Petty put up huge numbers. UCF needs a victory to give the oft-mocked American Athletic Conference — formerly known as the Big East — some legitimacy. Louisville helped the cause last season with a win over Florida in the Sugar Bowl, but a UCF win would do even more, especially with the Cardinals leaving the conference next season. 1. Both teams are 11-1 with legitimate wins over some strong teams. UCF beat Penn State in Happy Valley and hung tough with South Carolina in a 28-25 loss. The win over Louisville set the tone for the rest of the year, and time and again the Knights came through in the clutch. Baylor had problems against Oklahoma State, but steamrolled past everyone else, winning 10 of 11 games by double digits. 2. The Bears offense has been special all season long, and now it gets another national showcase. It fizzled the first time around when everyone was watching it struggle with the Cowboys, but given a few weeks to prepare, this could be devastating if it gets hot. Considering the way Baylor played in last year’s Holiday Bowl against UCLA in a 49-26 win, look out. 3. Unlike Baylor games, UCF games have been going down to the wire time and again. Eight of the last 10 games were decided by a touchdown or less, and seven of those were decided by four points or fewer. 1. QB Bryce Petty, Jr., Baylor: At the very least, he belonged in the discussion of possible Heisman finalists, throwing for 3,844 yards and 30 touchdowns with just two interceptions and 11 rushing touchdowns. While he has struggled a bit with his accuracy over the second half of the season, he’s been a tremendous deep ball thrower, averaging close to 11 yards per pass on the season. 2. QB Blake Bortles, Jr., UCF: You might not have thought about it at the time, if you even watched the game, but the UCF win over Louisville might have been a showdown of the top two quarterbacks to go in the coming NFL draft. Bortles has next-level size, arm strength and mobility, with a terrific power arm and the accuracy to get hot for long stretches. He’ll need to come up with a huge day to keep up the pace. 3. RB Lache Seastrunk, Jr., Baylor: While he didn’t win the Heisman as he boldly predicted, he still ran for 1,060 yards and 11 scores, averaging 7.5 yards per carry despite missing a few games hurt. The former Oregon Duck was a bowl star last season with 138 yards and a score on just 16 carries, and he’ll be one of the featured stars now that he’s 100 percent healthy.